Like the parent Beginner Books, Bright & Early Books feature the same affordable hardcover format, imaginative stories, and colorful pictures. Geared for a younger audience, these books use simple words, repetition, and pictures that act as clues to the text. Contributors include Dr. Seuss (`Mr. Brown Can Moo!` `Can You?, ` `There's a Wocket in My Pocket!, ` `The Foot Book`), Stan and Jan Berenstain (`Inside, Outside, Upside Down; Bears on Wheels`), Al Perkins (`Hand, Hand, Fingers, Thumb`) and Michael Frit (`I'll Teach My Dog 100 Words`). Preschool - Grade 1. Brother Bear explores the concepts of size and shape as he shops for a new hat. He tries on frilly hats and silly hats, bumpy hats and lumpy hats, until he finds the most perfect hat of all--his `own! Stan and Jan Berenstain were both born in 1923 in Philadelphia. They didn't know each other as children, but met later at school, at the Philadelphia College of Art. They liked each other right away, and found out that the both enjoyed the same kinds of books, plays, music and art. During World War II, Stan was a medical assistant in the Army, and Jan worked in an airplane factory. When the war was over, they got married and began to work together as artists and writers, primarily drawing cartoons for popular magazines. 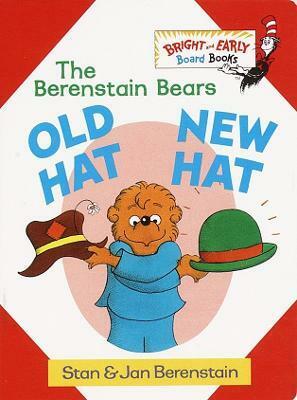 After having their two sons Leo and Michael, the Berenstains decided to write some funny children's books that their children and other children could read and enjoy. Their first published children's book was called The Big Honey Hunt . It was about a family of bears, who later became known as the "Berenstain Bears". Over 50 children's books later, Stan and Jan still plan all of their books together -- both write the stories, and both write the pictures. They live outside of Philadelphia in the country.